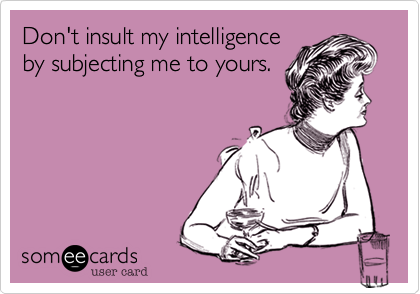 Insulting your intelligence is a tactic that brings in the big bucks. It’s the go-to tactic for many entities trying to capture your attention, or to influence your decisions. That ranges from commercials to TV pundits. You probably already noticed. It’s as if they think you didn’t learn how to count back in kindergarten. They want to ensure that you finally have clarity about comparing numerical values. Since this is election season, the same pattern of insulting your intelligence abounds. It can be found on any channel, from the most conservative to the most liberal. Every one of them is showing the highlight reels from prior debates. They fervently hope that the first debate tomorrow night will likewise give them sizzling sound bites that they can replay ad nauseum. Less work for them, less information for you. No one except you can guard against this dumbing down of the political discourse, as you approach decision day. Back when we were growing up, my dad used to skip the evening news. He made us kids watch it, and then report it back to him. Sometimes I wish TV pundits, moderators, and other talking heads, were half as intellectually curious. Both when talking to each other, andespecially when quizzing people running for office. Instead, they want to grab onto the lowest common denominator, to facilitate commentary from a parade of wannabe intellectuals. God forbid that they should seize upon important issues! They’re not interested in that! There are fewer people who possess enough policy gravitas, who they could invite to dissect the claims of either candidate. As a country, we face a number of domestic and international problems. Comment below about what issues matter to you, and how you expect our eventual president to tackle them. We are not trained monkeys, and politics is not a spectator sport. We should never substitute (nor fear!) talking with our fellow citizens with watching TV pundits. We hold a responsibility to have our own dialogues.